If you’re looking to establish yourself as a premier data center virtualization professional, the VMware Certification – Professional Datacenter Virtualization (VCP5-DCV) program is the best choice for your career success. Backed by the world’s foremost virtualization technology company, VMware Certified Professionals have been distinguished as having exceptional knowledge in the area of virtual datacenters; as well as the talents to effectively build and administer enterprise-level datacenters. If you’re looking to earn your VCP5-DCV certification, VMware Certification Marketplace offers the tools you need for success with our VCP5-DCV Exam Bundle! This bundle includes both the MeasureUp VCP-DCV5 practice exam, and the voucher needed to take your VCP5-DCV certification exam. When you purchase the bundle, receive 20% off the price of the MeasureUp VCP5-DCV practice exam. MeasureUp brings its decades of experience in providing IT practice exams to its VCP5-DCV practice exam and backs up their experience with a test-pass money back guarantee! 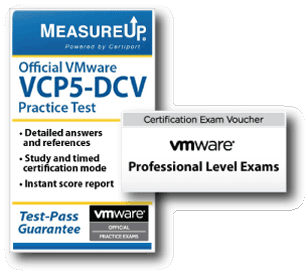 MeasureUp is the official practice test partner of VMware, offering detailed guidance in every aspect of the VMware VCP5-DCV exam – from planning, installing, configuring and upgrading your ESXi/vCenter server installation, to managing server alarms. Timed practice mode makes it possible to simulate your exam and prepare for test-taking; while the study mode allows you to explore each question and spend as much time as you need mastering concepts. Each question is based on those found on the actual VCP5-DCV exam, and each question provides sources to official VMware documentation. The second part of this valuable bundle is the VCP5-DCV voucher. This voucher is delivered instantly and allows you to register for your VCP5-DCV exam at any Pearson VUE testing center. Exam authorization is required before moving forward with your VMware Certified Professional exam. If you’re ready to advance your IT career, check out this great voucher bundle here or visit the full VMware Certification Marketplace for all the books, guides, practice exams and vouchers you need to earn your VMware Certification today!